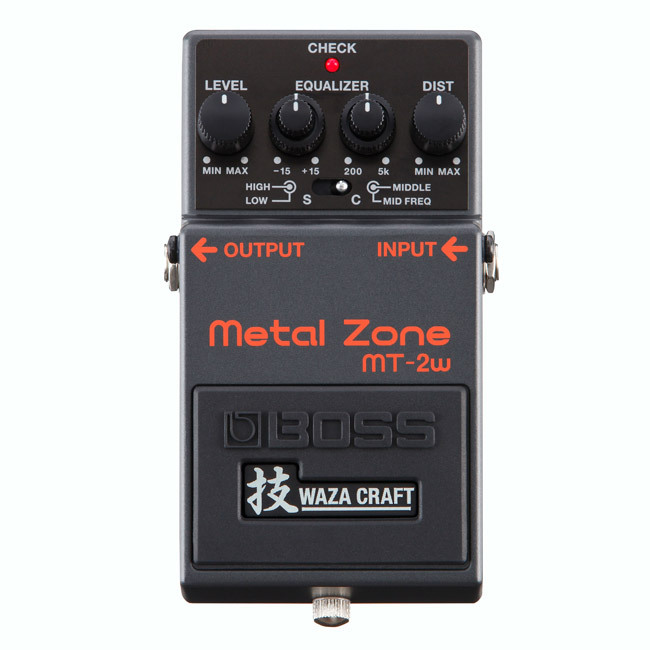 Boss announced today the launch of two new entries to its popular Waza Craft lineup: the MT-2W Metal Zone and DC-2W Dimension C. Expanded versions of the revered MT-2 and DC-2, these new pedals join other Waza Craft units like the BD-2W Blues Driver, DM-2W Delay, and CE-2W Chorus—bringing the full lineup to eight pedals in total. The MT-2W offers the circuit and sounds of the MT-2 Metal Zone, which was originally offered in 1991 and remains in production today. This pedal is the thing of legend in gear circles, with a love-it-or-hate-it reputation that's made it something of a punchline on forums and Facebook groups in recent years. Not to be confused with the aesthetically similar though tonally distinct Boss HM-2 Heavy Metal Distortion, the MT-2 is known for its tight midrange distortion that echos the '80s thrash tones of bands like Metallica. The new Waza Craft version of this venerable pedal includes two modes: Standard and Custom. Standard mode is much the same as the original but built with slightly higher-end components, making for more responsive attack, enhanced clarity, and lower noise, according to Boss. The new Custom mode offers a bit wider of a tonal range with "increased dynamics and rounder lower mids." In short, if you dig the MT-2's overall vibe and character, the Waza model—much like the BD-2W Blues Driver—offers an enhanced and somewhat expanded version of the pedal you know and love. For a bit more on the legacy and sound of the MT-2, check out this video with Marc Holcomb of Periphery. The DC-2W also offers a decidedly throwback set of tones taken from the original DC-2 produced between 1985 and 1989. While mostly known for its chorus, the Dimension C features four modes of modulation including two choruses, a flanger, and a Leslie-like effect, all of which work to expand the width and depth of any audio source. The design includes two different internal chorus circuits, making it particularly powerful via stereo outputs. Unlike most other Boss pedals, the DC-2 featured only model selection buttons with no variable knobs, meaning that the sounds are entirely preset. For fans, though, the appeal of this pedal has always been about the lush yet subtle textures. It's a pedal that's known more for its pure tone than its functionality, and this reputation has earned it a place as one of the more sought-after vintage Boss pedals. 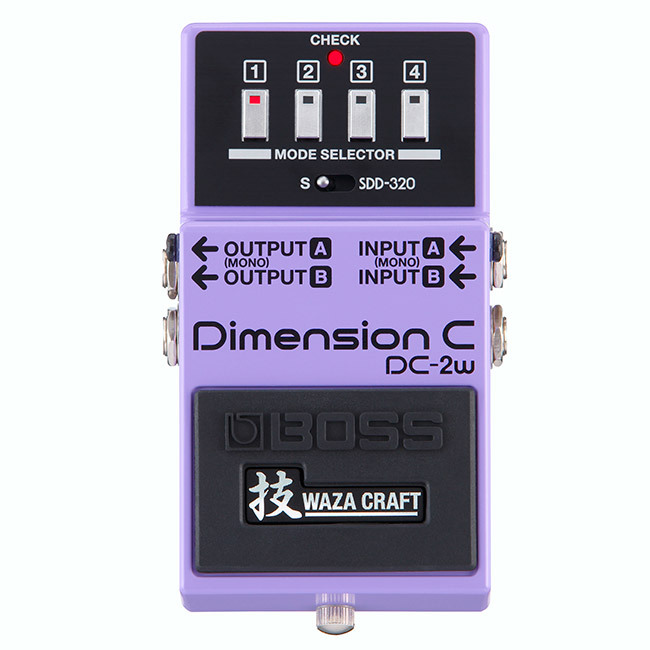 With the new DC-2W, Boss has replicated the original circuit while adding a SDD-320 option taken from the rackmount Dimension D unit on which the original pedal was based. This version also allows you to combine multiple modes at the same time, which, alongside the SDD-320 option, give 20 distinct modes to explore.